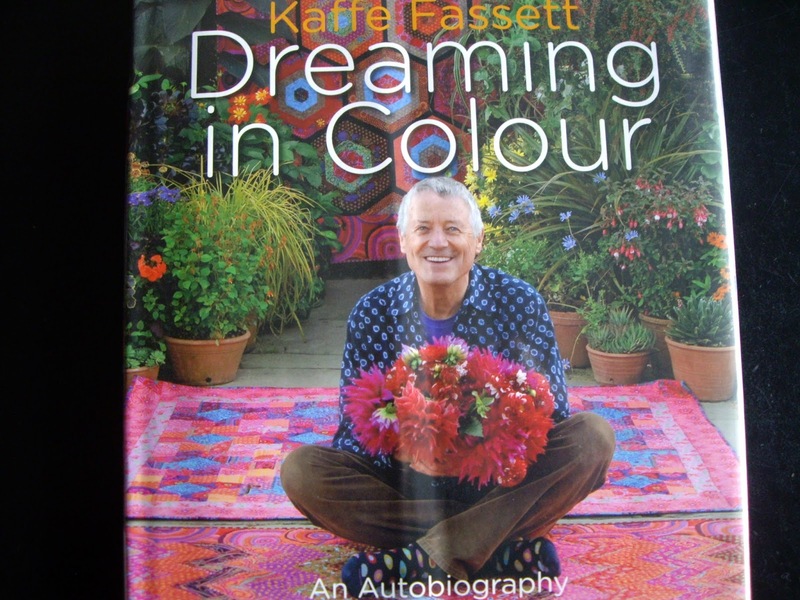 A page from the book "Dreaming In Colour"
I absolutely love the work of Kaffe Fassett - his name is pronounced like "safe asset". I first discovered his amazing output of needlepoint, quilts, knitting, mosaics and much more around 1999 when I really got into cross stitch and tapestry for the second time. I loved doing the little tapestries of cutesy subjects like lions and flowers etc that my grandmother would give me for birthdays and Christmases as a child. 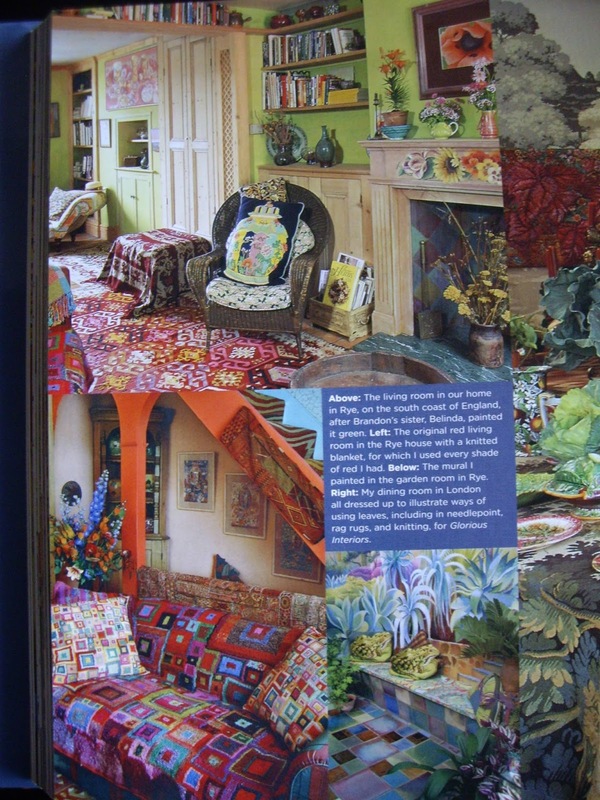 Anyway, during my second wave of needlework I borrowed "Glorious Interiors" from the library and was blown away by his use of colour. 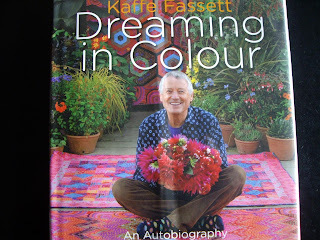 Right now i'm reading his autobiography "Dreaming In Colour" which is such interesting reading and filled with beautiful colour photographs. 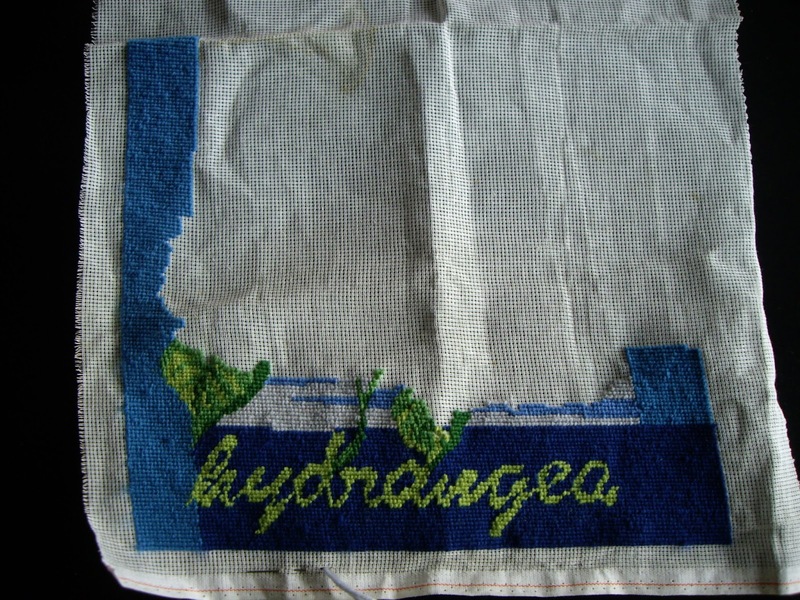 He has inspired me to pick up a very old UFO (unfinished object) which is a tapestry - needlepoint cushion of a Hyderangea pattern from an Italian cross stitch needlepoint magazine Le Idee de Sussanna. It doesn't matter that the entire mag is in Italian, you just need to look at the diagrams. This piece finished was supposed to be a Christmas present for my mother back in 1999 - haha, perhaps she'll get it this year! I did some work on it last night, and plan to do progress shots until its completion, which should be motivating. Also, i've decided that I cannot start any new projects until I finish my current ones. 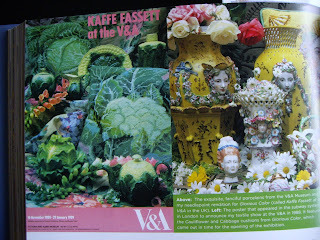 You might notice i"m not using a frame or hoop - Kaffe doesn't use them - so there! Back to Kaffe, he's had exhibitions worldwide and at The V & A - so he's pretty special. Here are some pictures from the book and a picture of the Hyderangea tapestry in progress. I made lemon friands yesterday and lemon curd last week and thought morning tea - yum! Especially nice to accompany my cup of tea. 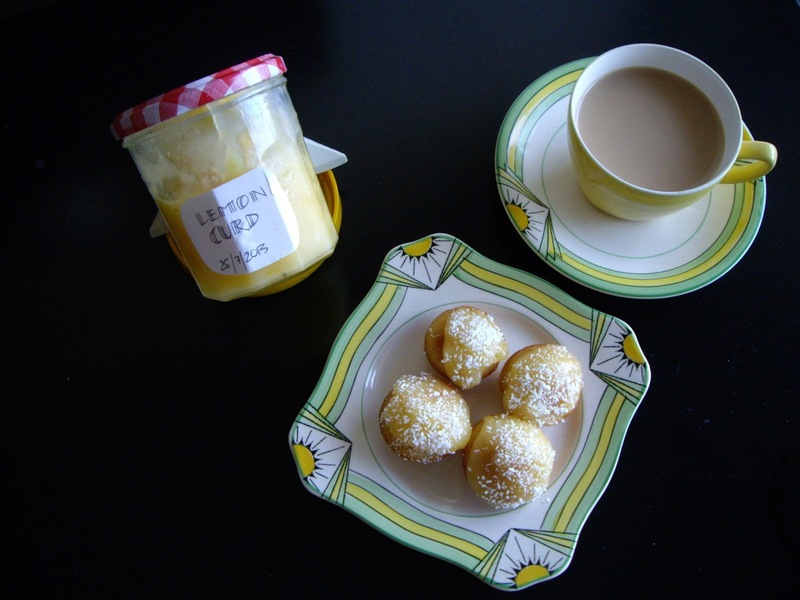 Sprinkled some coconut on top of the friands, delish. The vintage English cup and saucer set, I have no idea what era it's from but it looks Art Deco or 30's to me. Printed underneath the plates is: Solian Ware - Soho Pottery Ltd - Cobridge England and the pattern is aptly titled "Sun-Ray". My sister regularly lures this neighbourhood cat named Wasabi into her house for visits and pats and he's pretty cute! 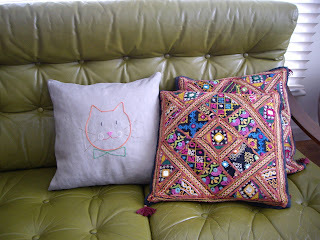 It was her birthday a couple of weeks back so I made this cushion for her. 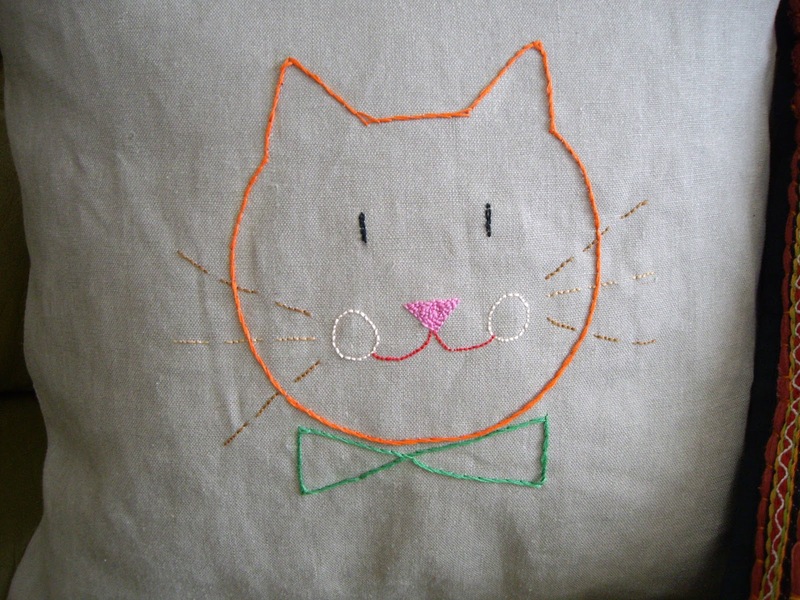 I used linen fabric and DMC cottons and I'm pretty happy with the results even though his bow tie is not perfect, I think it adds to its' folksy charm. I think it looks great on her sofa/couch with the other cushions. Well it has been over a year since I last posted. 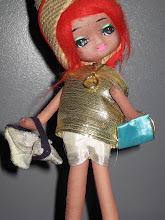 A bit over doing outfit posts seeing as I don't have an amazing camera and can't take clear, sharp pictures like other blogs seem to have. I thought I'd change the focus from fashion to things I make. This little softie was made over a month ago for my nieces birthday and from her reaction upon opening the paper, pretty sure she loved it! 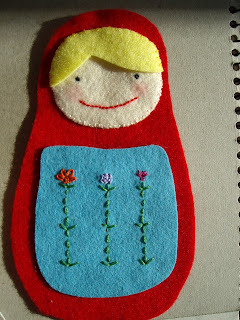 I used felt, cotton embroidery thread and toy stuffing. The design was drawn on cardboard first and cut out for the template. The cheeks were done using a watercolour pencil and I like how there's just a hint of colour. 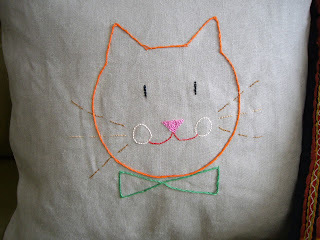 I didn't remember to take a shot once it was completed, but around the edges, blanket stitch was used. This was all done by hand and took around 7 hours - granted I was sitting in front of the t.v but I'm pretty slow - I was so relieved at the end! I have been working on something else this weekend but will wait until tomorrow to post as it's a gift. 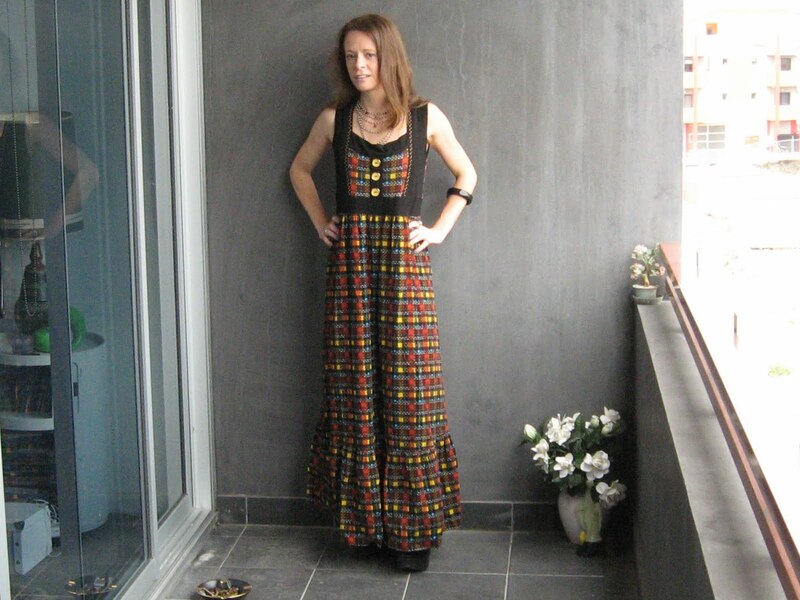 It's spring here and today looks beautiful - peace out! 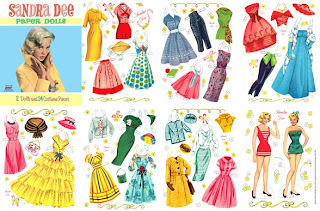 I discovered Sandra Dee recently whilst watching "imitation of life" made around 1958. But upon further research discovered she had quite a sad life as many child stars do. So now I just want to get into some more 50's movies. How awesome is this paper dolls book!! I would have frothed at the mouth as kid to have this. I hope everyone enjoyed themselves on new years. I went to the pub I always go to, had a ball, got a taxi without any fuss at all and was home by about 3am. Great success! !